US startup Yottavote has developed an NFC voting system designed to allow consumers to give anonymous feedback to merchants and other businesses via their smartphone. 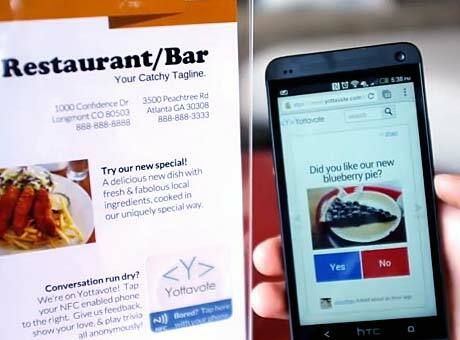 Yottavote’s NFC Tag Service can be used to include NFC tags in table stands, posters or flyers. The URL stored in the tag links to a business’ individual customer question, list of questions or Yottavote profile page. Consumers can then give their feedback by answering the questions, without providing any personal details. Yottavote is now looking for brick and mortar businesses such as bars, restaurants, sporting stadiums and doctors’ offices to adopt the platform as pilot customers, the company’s Jonathan Chu told NFC World.